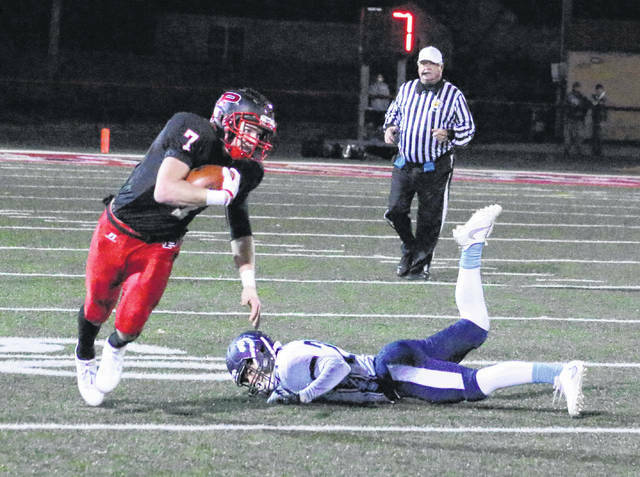 Point Pleasant quarterback Cason Payne (7) breaks away from a Philip Barbour defender during a Class AA opening round playoff game on Nov. 11, 2017, at Ohio Valley Bank Track and Field in Point Pleasant, W.Va.
Last Week: Point Pleasant defeated Mingo Central 42-35, in Delbarton; South Harrison lost to Doddridge County 52-14, in Lost Creek. PPHS offense last week: 345 rushing yards, 136 passing yards. SHHS offense last week: 52 rushing yards, 199 passing yards. PPHS offensive leaders last week: QB Cason Payne 15-of-20, 136 yards, 2TDs; RB Cason Payne 17 carries, 228 yards, 2TDs; WR Josh Wamsley 5 receptions, 47 yards, 2TDs. SHHS offensive leaders last week: QB Jaren Robinson 12-of-20, 193 yards, 1TD, 1INT; RB Landon McFadden 5 carries, 29 yards, 1TD; WR Brenten Barnette 6 receptions, 49 yards. PPHS defense last week: 77 rushing yards, 359 passing yards. SHHS defense last week: 278 rushing yards, 163 passing yards. 1. The Big Blacks turned out over nine yards a per carry on the ground last week and scored three times in the running game. Point Pleasant was also efficient through the air, connecting on 75 percent of its pass attempts and scoring two more TDs. 2. In Point Pleasant’s last six regular season games, the Big Blacks have surpassed the 480-yard mark five times. Last week was just the second time in that span that Point Pleasant has allowed over 400 yards to an opponent. 3. The Big Blacks turned defense into offense last week, as Nick Parsons returned an interception 65 yards for the game’s opening touchdown, and Josh Wamsley returned an interception over 70 yards to put PPHS inside the 10-yard line and help seal the game. 4. In South Harrison’s opening week setback, not only did Landon McFadden lead the team on the ground, he also hauled in five passes for 129 yards with a touchdown. SHHS allowed five rushing scores and two more through the passing game. 5. A victory would give Big Blacks head coach David Darst his 100th career wins. The 12th-year skipper of PPHS currently holds a record of 99-30, giving him the second most wins in program history and the school’s highest winning percentage at 76.7. Last Week: Wahama lost to Ravenswood 42-0, in Ravenswood; Miller lost to Berne Union 26-0, in Sugar Grove. Last meeting between the teams: Oct. 20, 2017. Wahama won 14-7, in Mason Waterford won 58-0, in Waterford. Current head-to-head streak: Wahama has won 1 straight. WHS offense last week: N/A. MHS offense last week: 204 rushing yards, 53 passing yards. WHS offensive leaders last week: QB Abram Pauley 2-of-6, 26 yards; RB Brady Bumgarner 9 carries, 43 yards; WR Jacob Warth 1 reception 22 yards. MHS offensive leaders last week: QB Colby Bartley 5-of-9, 53 yards, 1INT; RB Blayton Cox 18 carries, 144 yards; WR Blayton Cox 3 receptions, 33 yards. WHS defense last week: N/A. 1. Wahama’s last trip to Hemlock resulted in the White Falcons’ first and only loss to Miller. MHS won that game by a 40-0 count. WHS holds a 7-1 record in the all-time series, which began in 2010. 2. Last week’s 42-point margin of defeat marks Wahama’s largest setback since the final game of the 2016 season. Five of Ravenswood’s six touchdowns came on the ground. 3. Miller allowed three passing touchdowns and one on the ground in last week’s setback. MHS trailed by 19 at halftime and allowed a 71-yard scoring pass in the fourth quarter. 4. Only three Tri-Valley Conference Hocking Division teams began the season with a win — Southern, Trimble and Waterford. Along with Wahama or Miller, South Gallia or Federal Hocking is guaranteed to break through in the win column this week. 5. This is the earliest in the season that these teams have ever faced each other. From 2010-to-2013 Miller and Wahama played in Week 10, with the game being played in Week 9 the last four seasons. Last Week: Green defeated Dohn Community 54-14, in Franklin Furnace; Hannan lost to Tug Valley 56-0, in Williamson. Last meeting between the teams: September 12, 2016. Green won 60-0, in Ashton. Current head-to-head streak: Green has won 9 straight. GHS offense last week: 378 rushing yards, 0 passing yards. HHS offense last week: 18 rushing yards, 3 passing yards. GHS offensive leaders last week: RB Mackie Kingery 116 yards, 4TDs. HHS defense last week: 367 rushing yards, 100 passing yards. 1. Green’s last trip to Ashton was on Sept. 12, 2016 and resulted in a 60-0 Bobcats victory. GHS is 9-0 against Hannan in all-time meetings, with last season serving as the Bobcats’ lone win of the year. 2. In last week’s triumph, Green didn’t attempt a pass or a punt. The Bobcats were one of 11 teams in Ohio’s Region 27 to begin 2018 with a victory. 3. The Bobcats are looking to win back-to-back games for the first time since defeating Manchester and Hannan in the opening two weeks of the 2016 season. 4. In last week’s setback, the Wildcats allowed eight offensive touchdowns, six rushing and two passing. Hannan turned the ball over five times, tossing three interceptions, while coughing up two fumbles. 5. This is the first of five home games for Hannan this season. The Wildcats also welcome Hundred, Van, Buffalo and Parkersburg Catholic to Ashton this fall.